One of the city’s sexiest rooftop bars, the Press Lounge features panoramic views of Manhattan and the Hudson River. It is located above the Ink48 Hotel in Hell’s Kitchen/Midtown West, and serves seasonal cocktails and light fare. Located above the largest art museum in the U.S., this is one of the nicest rooftops, where you can socialize, relax, and take in views of the Midtown Manhattan and Central Park. Despite its amazing location, the rooftop bar isn’t just for art lovers. Gallow Green is a unique rooftop garden bar and restaurant that makes you feel like you are eating/drinking among lush greenery and transported away from the city. Gallow Green is located atop the McKittrick Hotel, famous for the interactive theatre performance Sleep No More. This swanky rooftop venue is more of a nightclub hotspot that offers a great view of downtown Manhattan. It is the place to be seen, and it often hosts impressive celebrity clientele. That said, it is not the easiest to get into without paying for a cover or minimum bar tab. This is one of the largest indoor/outdoor rooftop bars with a large seating area overlooking the Empire State Building. One of the best features of this rooftop is that it is not pretentious and has a very casual vibe. They also have heated plastic igloos in the wintertime so that you can still enjoy cocktails and city views, without freezing. Located on the top floor of the trendy The Standard Hotel by the High Line in the Meatpacking District, Le Bain offers one of the best Manhattan views. The rooftop is covered in faux grass, making it feel a bit more tranquil like a garden party. Jimmy is located on the 18th floor of the James Hotel in the heart of Soho. There’s an indoor lounge with floor-to-ceiling windows, and there’s an outside patio with a small pool. One of the city’s hottest rooftop bar & restaurants, Mr. Purple is located above Hotel Indigo in the Lower East Side. Make sure you sip on the namesake cocktail spiked with casamigos reposado tequila, cranberry liqueur, allspice dram, apple, and lemon. The bar and lounge on the 65th floor the Rockefeller Center is one of the highest rooftop terrace and bar in New York City. You’ll be eye-to-eye with the Empire State Building while you snack on charcuterie and sip on bubbles. Bar SixtyFive is not cheap, so make sure you come prepared. 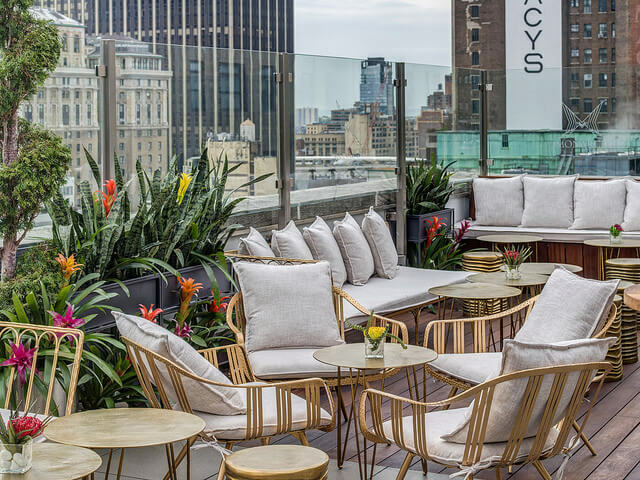 The Monarch Rooftop is one of New York City’s most popular rooftop bars. It has an expansive interior & exterior lounge area with unobstructed views of the Empire State Building. It’s located on the rooftop of the Courtyard by Marriott Hotel at Herald Square. Although this list should keep busy for a while, check out NYC’s Best Rooftop Pool Bars on followsummer – a mature & sophisticated travel blog designed to guide your exploration of the world.